SAN LUIS OBISPO — Cal Poly’s third Summer International Workshop has attracted 135 participants — including more than 120 from Egypt — seeking the university’s Learn by Doing style of education. The turnout is the largest since mechanical engineering Professor Eltahry Elghandour inspired the annual series of learning opportunities in 2016. In February, he traveled to Egypt where he met with several universities and held information sessions promote the program. The two- to four-week workshops, in four of the university’s six colleges, began this month and conclude in early August. They are offered through the university’s Extended Education unit, which provides access to Cal Poly’s unique academic programs and educational resources through a series of workshops, trainings and certificate programs. Dianna L. Previs, the assistant director of Professional and International Training Programs and Extended Education, said there was even greater demand from those who applied to participate. “If we didn’t have a problem with visas we could have 320 people attending this year. That’s how many applied this summer,” she said. Although open to international students at least 18 years old, the majority of participants attending this summer are from Alexandria, Egypt-based Arab Academy of Science and Technology and Maritime Transport. They are participating in workshops in engineering, robotics, architecture, business innovation, marketing, finance and business information systems and logistics and supply chain management. Tietje said the students were attracted to San Luis Obispo by Cal Poly’s emphasis on hands-on learning. And the young men and women, who are living on- and off-campus during the workshops, are interested in learning about American culture. Cal Poly Extended Education is a self-support unit that works closely with university, business, community and international partners to provide access to Cal Poly’s unique academic programs and educational resources. It offers a diverse range of degrees, professional development certificates, non-credit courses, youth programs and international education programs. For more information, visit http://extended.calpoly.edu/. For more details about the Summer International Workshop, visit http://intlworkshops.calpoly.edu/. Participants at Cal Poly’s third Summer International Workshops learn robotics coding. The annual workshop also includes sessions on engineering, architecture, business innovation, marketing, finance and business information systems and logistics, and supply chain management. 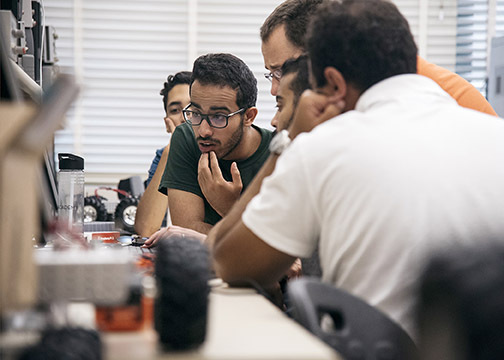 This year 135 young people — including more than 120 from Egypt — are on campus seeking the university’s Learn by Doing style of education in workshops that will continue through early August.